Innovative solutions open up markets – and attract emulators. Patent protection protects your breakthrough. A good trademark is a valuable advertisement for your company, services and products. It deserves the best possible protection. The design of your products distinguishes you from your competitors. This makes your products especially popular. All the more reason to protect them. Utility model: Balancing costs and comprehensive protection. Patent attorneys specialize in law, the natural sciences and technology. Raffay & Fleck patent attorneys are experts in all intellectual property matters. If you would like to file a patent application or seek trademark protection or extensive guidance on protecting your intellectual property, we offer years of experience. We have long been established in the Hanseatic region and take a personal approach. Our patent and trademark attorneys draw upon their legal, scientific and technical expertise to best suit your needs. As your personal patent attorneys, we prepare patent applications, oversee application procedures until patent protection has been established, file trademark applications and register your design (design patent). 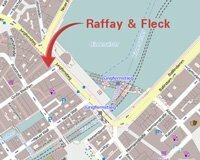 Raffay & Fleck provide reliable advice on all issues pertaining to intellectual property rights, such as patent and trademark protection. We act swiftly and judiciously. For example, we can usually file your trademark on the same day so that the trademark office can start the review immediately and register your trademark.